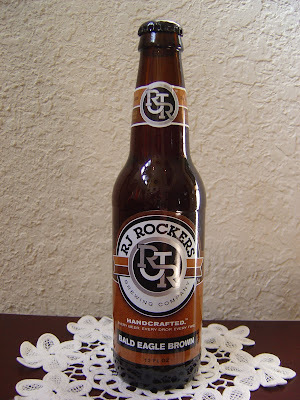 Tonight I'm drinking Bald Eagle Brown Ale brewed by RJ Rockers Brewing Company in Spartanburg, South Carolina. The label says "HANDCRAFTED." and they apparently trademarked that word. Below that it says, "EVERY BEER. EVERY DROP. EVERY TIME." In faint, almost unreadable letters, the label also states that "BEER IS AN ART" so there's a lot going on here; and they love CAPITAL LETTERS! Finally the date of 102209 is on the back of the label. I am guessing that's a drink by date, but could be wrong, and I did spend 10 minutes on their website to try to find out. But speaking of expiration and drink by dates, I mentioned a few days ago that I was going to contact Corporate Total Wine about their Greenville, SC store's freshness issue. Which of course I did right away. This beer came from that store. Sweet caramel, nutty, rich aroma. The flavors start out nutty along with a nice toasted bread component. Then some hoppy bitterness rushes in. The back side of this beer is where you will find some richer malt and chocolate flavors. Not a lot going on and a bit thin. The medium carbonation is prickly and not nice. The finish is dry and the aftertaste is a little unpleasant, with bitter and alcohol left to linger. I don't know. The more I drank the less I wanted to finish it. Sorry, not today.